At the end of the nineteenth century, various economic and political reasons have driven Jewish people on the roads of migration. As a result, several Yiddish cultural microcosms flourished in major cities such as Berlin and Shanghai. The development of Yiddish cultural industries followed in the wake of Jewish migrants. The Klal-Farlag counted among the Yiddish publishing houses that had moved with the Jewish communities from Eastern Europe to Berlin. Originally founded in Kiev by Zeev Wolf Latzki-Bertoldi, the Klal-Farlag continued its activities in Berlin from 1921 onwards, where it published Yiddish literature, school books, translations, etc. Born in Minsk, the writer Rafael Seligmann (1875-1943) was an active contributor to the Berliner Jewish intellectual scene. Seligmann translated into Yiddish works by Gustave Flaubert, Prosper Mérimée but also Laozi. Der bukh funm getlikhn gezets (The book of divine law) was published by the Klal-Farlag in 1923, in a cheap paperback format. This format was very popular at that time among the Yiddish readers, not only in Germany, but also abroad, all the way to Shanghai where a few thousands Russian and Polish Jews had settled after the October Revolution of 1917. Even though Yiddish newspapers were locally printed, book publishing was not very dynamic at that time in Shanghai and Yiddish titles were imported from Europe. Since 2017 Leiden University Libraries holds a copy of Der bukh funm getlikhn gesetz. It is part of a collection of more than seven hundred Dao de jing editions brought together by the late professor Peter Gumbert and sold to the library by his family. The archival documents testifying to Gumbert's collecting activities include correspondence pertaining to this Yiddish translation by Seligmann. In May 1995, Emile Schrijver, then attached to the Special Collections department of the Universiteitsbibliotheek Amsterdam as curator of Jewish collections, wrote a letter to Gumbert. He had found information about this book at the Library of Congress in Washington and included a copy of a page from The Yiddish Author-Title Catalog of the Yivo Library. 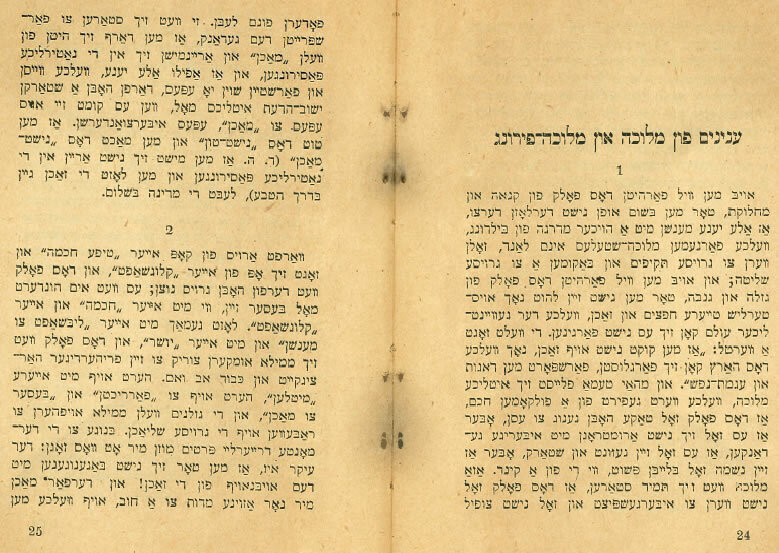 Nearly fifteen years later, Gumbert ordered photocopies of this Yiddish translation from the Maison de la culture Yiddish-Bibliothèque Medem in Paris. In the light of this correspondence, we understand that Gumbert - whose fascination for the translation of the Dao de jing in western languages started in 1956 - was in July 2009 still looking for a copy of Seligmann’s translation for his collection. Further research is needed to establish when exactly Gumbert finally purchased this book.